Given by Minton & Co.
For more than a century genuinely classical sculpture in white marble had been one of the highest forms of collectable art and the most costly, implying continental travel, an expensive education and aristocratic taste. Ownership of statuary porcelain, otherwise known as Parian ware, suggested at least a peripheral association with this highly exclusive world. Where the statuary became available through the Art Union - a subscription society whose members were automatically entered in a lottery, with works of art as prizes - it became even more popular and accessible to the middle classes. Minton produced over 500 Parian figures between 1845 and 1910. Parian ware (Minton's trade name for the material, which was generally adopted) is a highly vitrified ceramic closer to European hard porcelains than English bone china. The basic materials are feldspar, Cornish clay and Cornish stone. Parian is largely impervious to damp and dirt and is easily cleanable. Each part of a figure was made in a separate mould and the smooth appearance of the finished figure was admired as much for the technical skill in its making as for its aesthetic qualities. 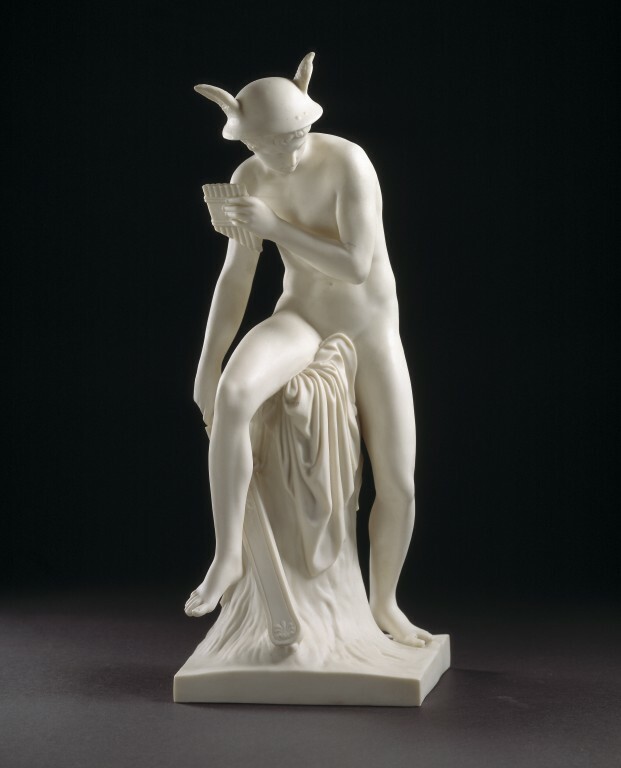 According to the Art Union magazine (April 1847), the Parian figure was modelled from a bronze which was lent for that purpose by the Duke of Sutherland to Minton. The marble statue from which this is copied was carved in 1822 in the studio of the Danish Neo-classical sculptor Bertel Thorvaldsen, from his model made in 1818 in Rome. The marble is now in the Thorvaldsen museum and mausoleum in Copenhagen. Thorvaldsen was extremely prolific and his sculptures provided the source for a vast range of copies in ceramic and other materials. Here Mercury is depicted holding a broadsword with which he is to slay the 100-eyed giant Argus. Biscuit figures of Mercury were produced by the SŠvres porcelain factory, near Paris, and then copied by the Royal Danish Porcelain Factory in 1839. This version was issued by Minton in 1847 and included in the Society of Arts exhibition of March that year and in the Great Exhibition held in London in 1851. Another Danish porcelain manufacturer, Bing & Grondahl, produced a version in 1862. Bertel Thorvaldsen is believed to have been born on 19 November 1770 (although in old age, when asked, he gave his year of birth as 1768). He studied at the Royal Academy of Fine Arts, Copenhagen, where he won a gold medal for sculpture and a travelling scholarship. He arrived in Rome, then considered the centre of the artistic world, in 1797 and stayed there for 40 years, running a large studio and fulfilling a vast number of commissions. After returning in triumph to Copenhagen with a ship full of sculptures, he commisioned the architect Michael Gottlieb Bindesboll (1800-1856) to design a museum to hold his own works and his collection of antiquities. Thorvaldsen died suddenly in 1844 and was buried at the centre of the museum.